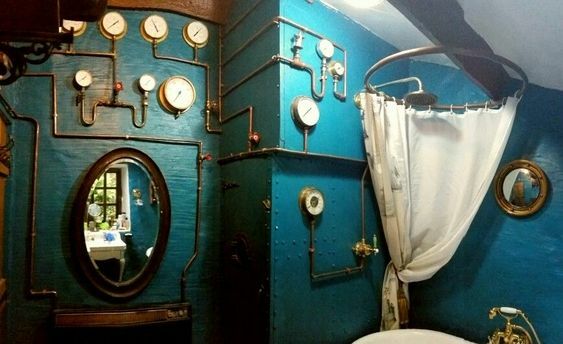 Do you want to have your own steampunk bathroom as in an alternative world described by the books of Terry Pratchett and Jules Verne? Do you think it’s possible? By the end of this article you would definitely be a master in steampunk decor and trends. Generally speaking, this is a sort of design that combines historical features with anachronistic technological elements inspired by science fiction. Is steampunk design the same as industrial design? In a way, yes, because they both bring an old-century vibe into the decor. However there are some differences between industrial and steampunk design. The first one favors heavy factory elements, while the steampunk design is a bit more delicate and surreal. What is a steampunk bathroom? 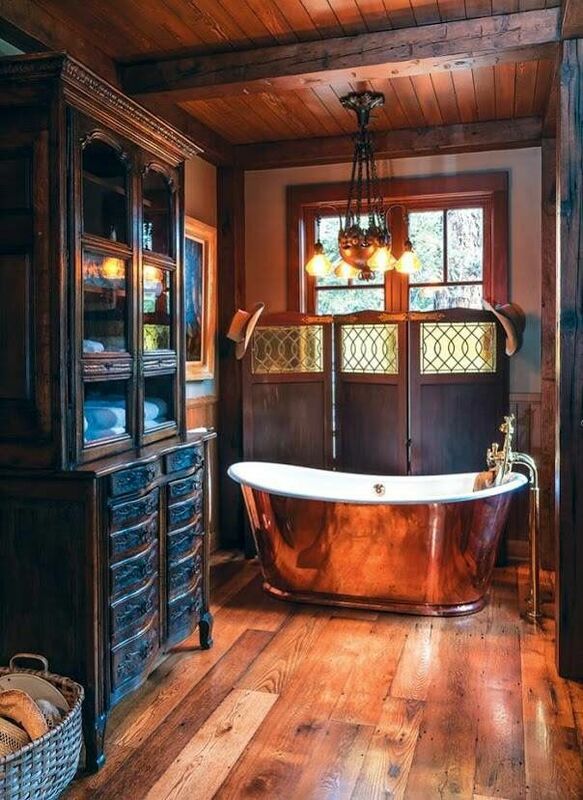 Steampunk bathroom is a mannish kind of bathroom that surely makes a solid statement. 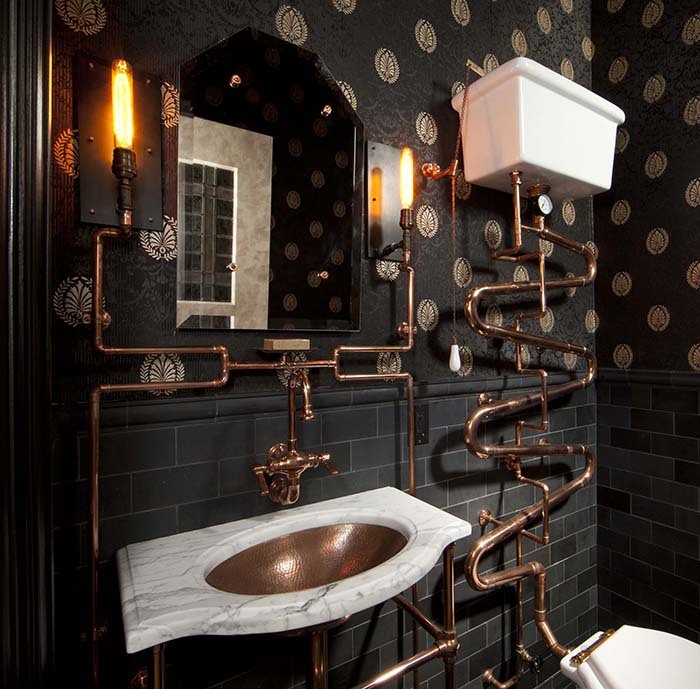 The steampunk bathroom decor often embraces an industrial vibe and it is made of elements like copper pipes, brass, and other mechanical items to fuse a strong Victorian groove. One more accent is steam valves and accessories that look like steam transportation system. 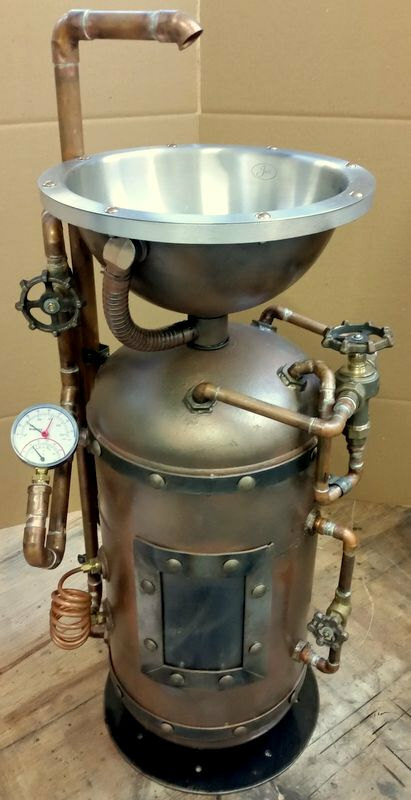 Is it expensive to have a steampunk bathroom? Since some of the key features are the use of pipe and copper elements, it could be very expensive. 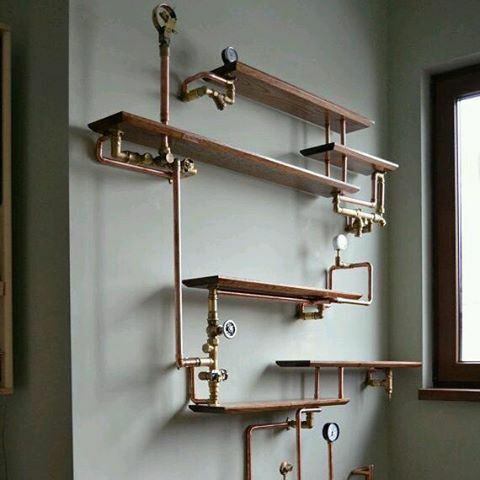 Here is a stunning bathroom shower system made completely out of copper. It combines contemporary chic with a spin of ancient design elements. What we like most is the fact it builds a cheery interplay between human, water, and space. Take a look at this majestic steampunk tub made out of copper as well. Beautiful, isn’t it? The solid wooden floor completes the historical vibe – one of the main components of the steampunk interior design. The golden pipe embellishes the beauty of the copper bathtub, giving a relaxing and pure ambiance during the bath time. 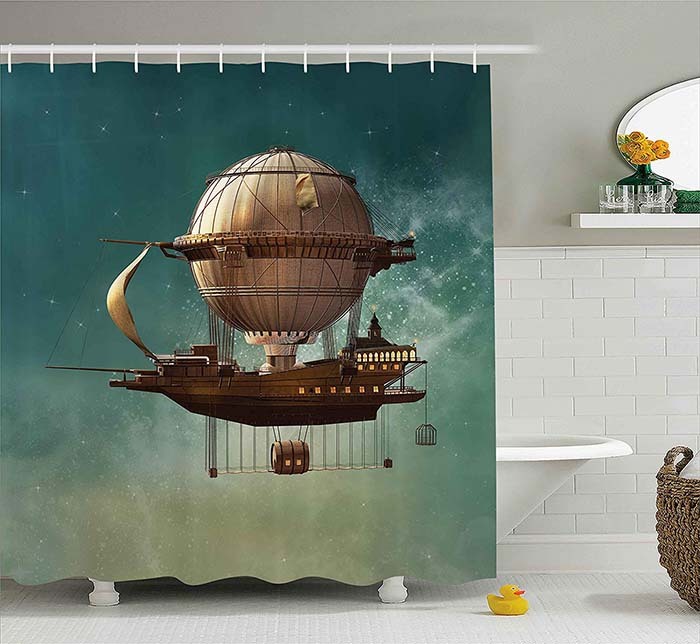 Displaying a conversational, fantasy shower curtain is a smart and affordable way to give a steampunk-styled makeover to your bathroom. Plus, it is unique and you can’t see it in any bathroom space. 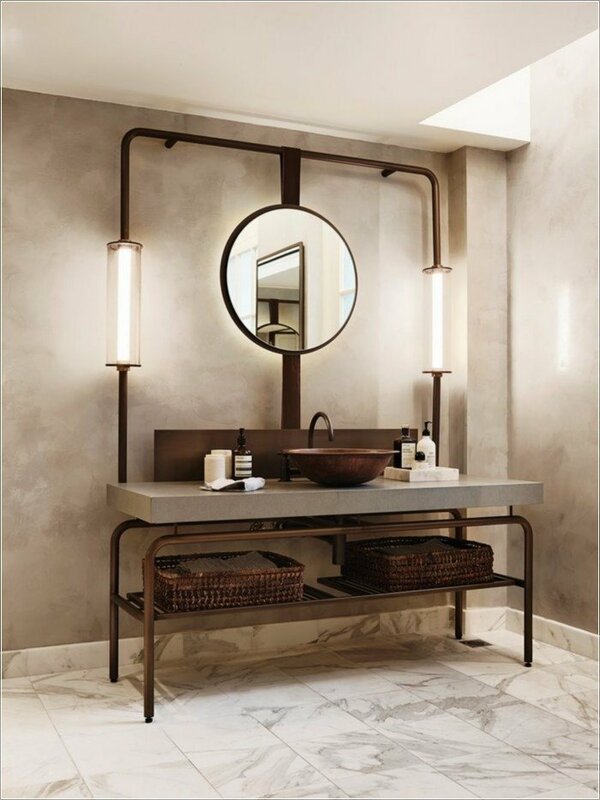 The most remarkable element in this bathroom is the 3 lamps arising from the copper pipe. The shadowy lighting surely creates a nuance of a romantic story. Take a look at the pipes – even they look very old and that have been using for ages. 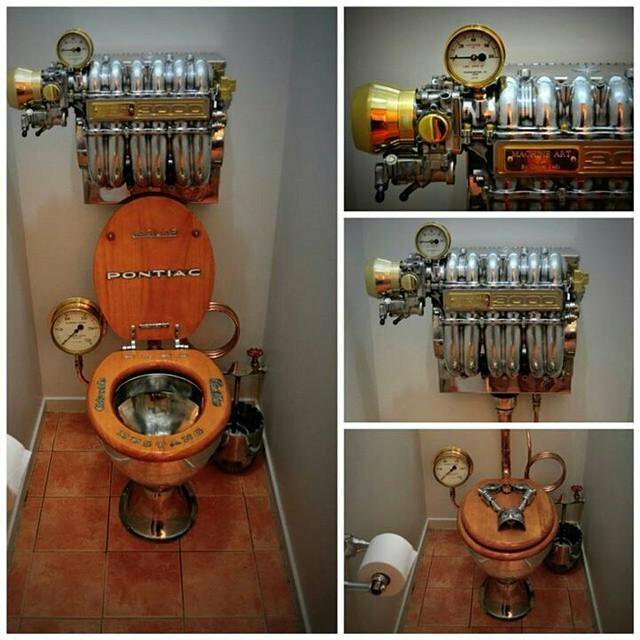 Creating a refinement of steampunk in your bathroom does not have to be so difficult and crazy expensive. What do we mean? Even a single industrial-futuristic accessory will do in a pinch (take a look at the cool toilet paper holder on the picture above). 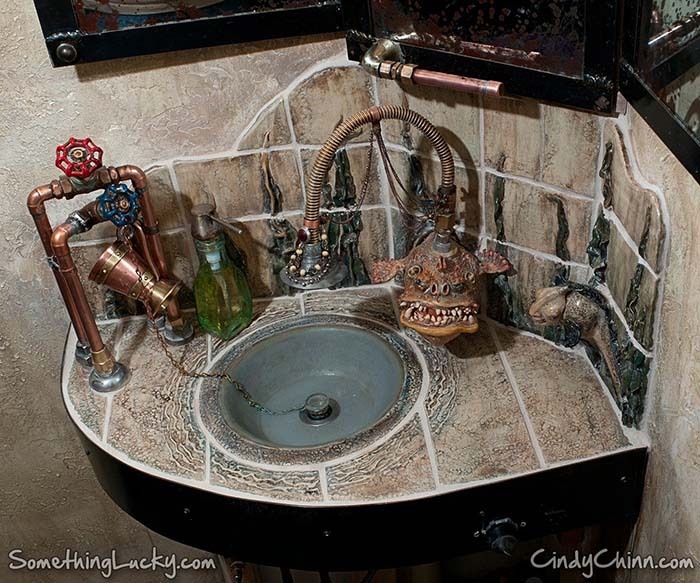 What do you think about this custom-sculpted tile featuring a monstrous steampunk faucet and handles? They are rusty and ornamented to complete the design in this truly unique and conversational bathroom. Remember, it’s not just the lightings that have an essential role in creating the atmosphere, but also the vanity and the mirror frame. These ones on the picture above, for instance, add extra charm and artistic look to this bathroom that represents the interior design of Victorian style. 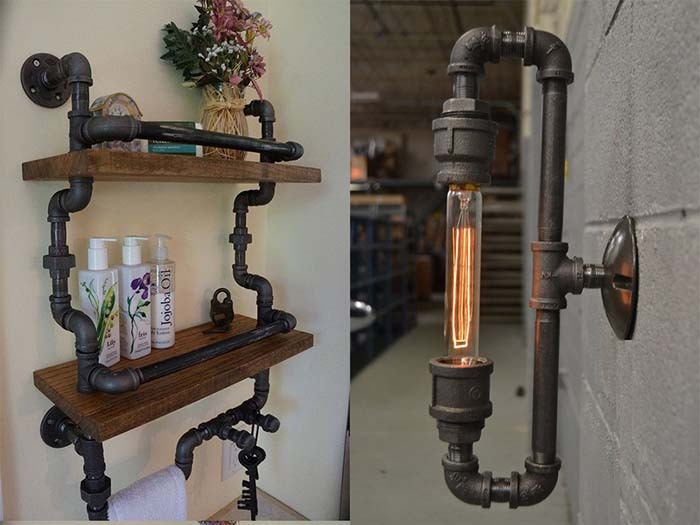 The steampunk styled fixtures are a crucial aspect you should take care of if you want to give your bathroom a unique industrial makeover. This shelves are made out of black pipe and reclaimed wood elements, and all set to give industrial appeal to your space. 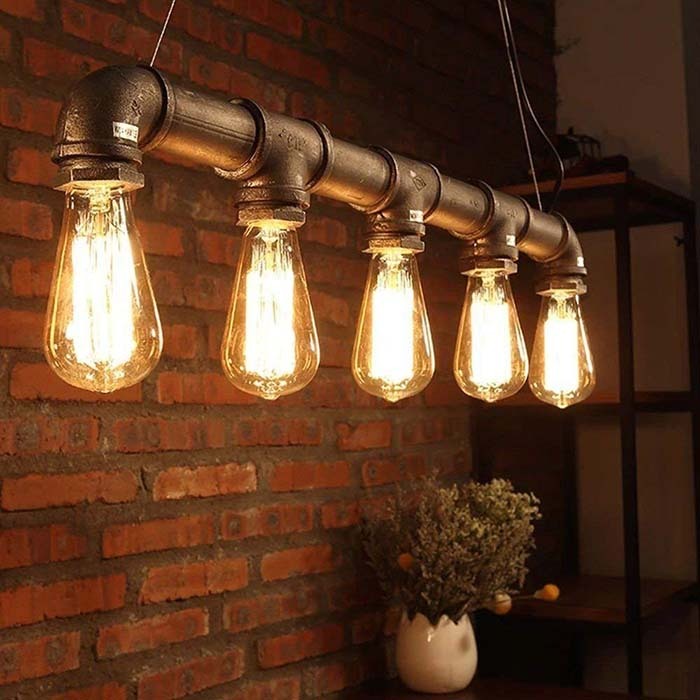 This ceiling pendant light made out of an iron pipe is just ideal for creating a vintage industrial looking to any bathroom area. Thanks to its size, this conversational piece of decor will definitely be the focal point in the room. 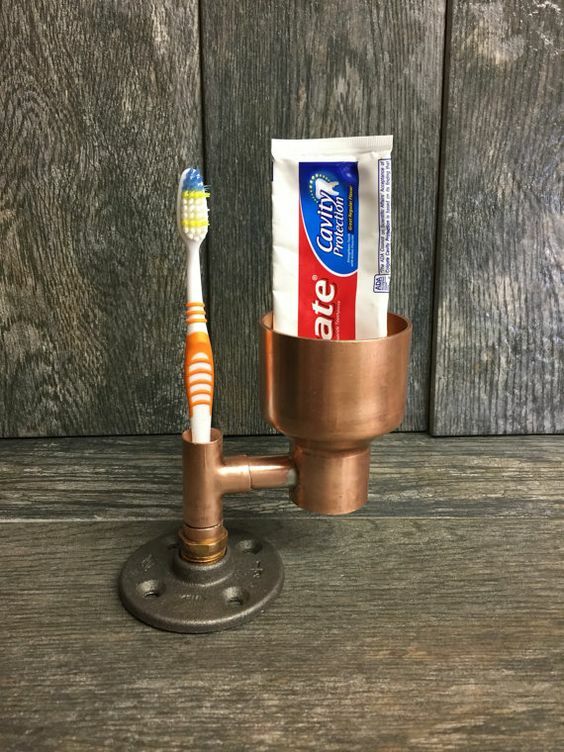 If you can find some ancient pieces of furniture, why don’t you try to refurbish and repurpose them into majestic steampunk theme accessories like this beautiful sink made out of copper and marble? Besides, new furniture doesn’t suit the steampunk very much. 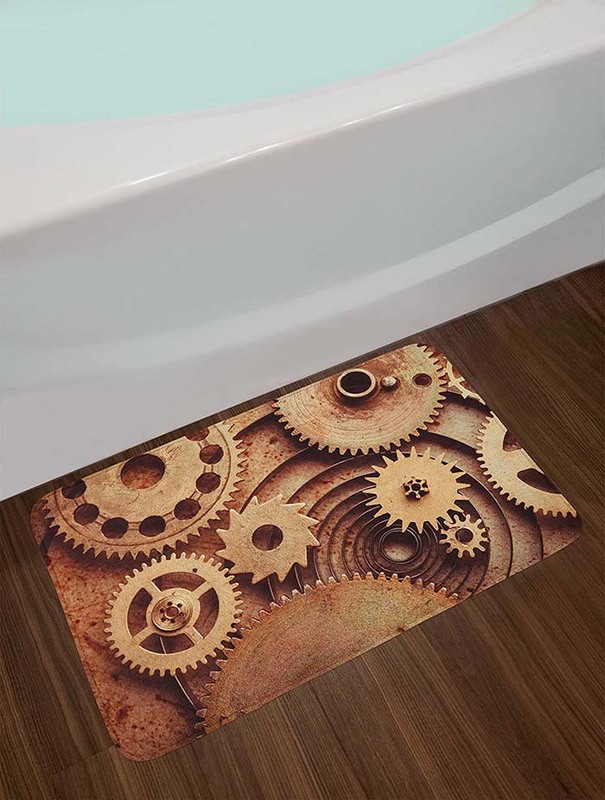 We love this “Inside The Clocks” themed bath mat that could actually be displayed in any other room of the house. It brings a strong industrial, masculine vibe and, moreover, it won’t cost much. 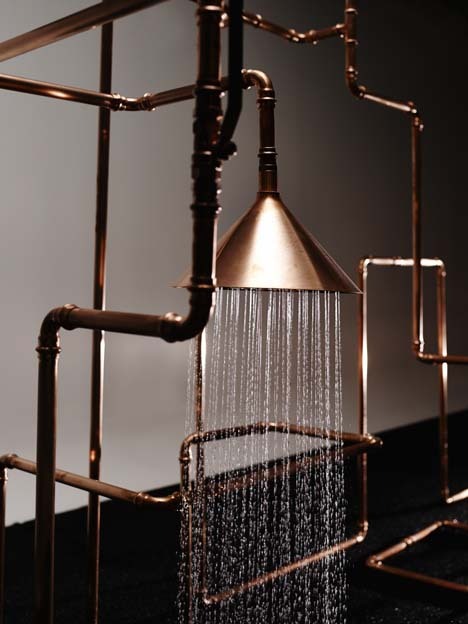 We wouldn’t dare to skip this sophisticated shower made out of copper pipes. It is referring to steampunk style owing to its vintage industrial design. The oversized shower head also looks adorable and rustically chic. 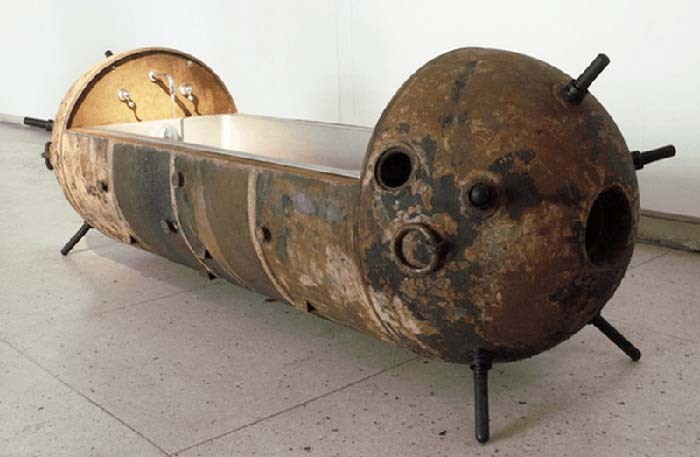 Made out of an old naval mine, this DIY industrial style cool bathtub is surely a large source of influence of all steampunk enthusiasts. Taking a bath in this rusty tub is absolutely going to flutter your day starting from the morning. Plus, it will add unique vibe to your bathroom space. 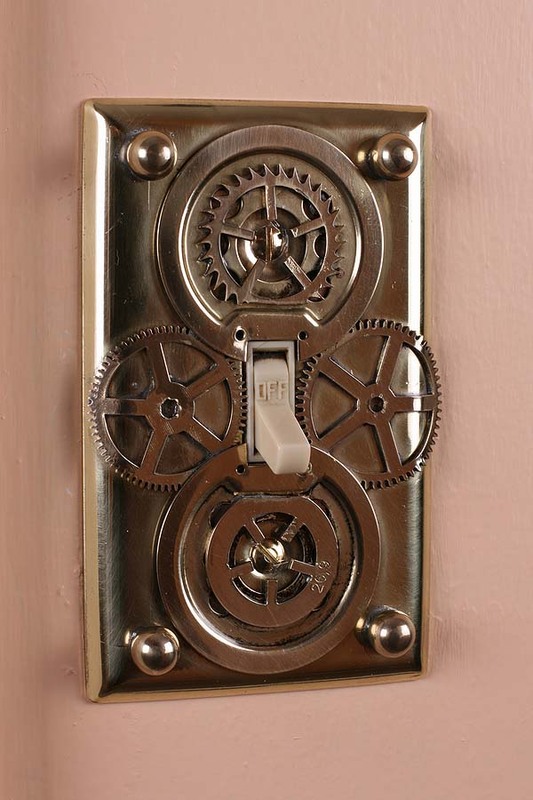 Speaking of steampunk bathroom fixtures, this DIY light switch may be component that would give the final touch to the your bathroom industrial makeover. Here is an idea for a modernistic steampunk vanity, along with an oval mirror, that looks very airy and minimalistic. 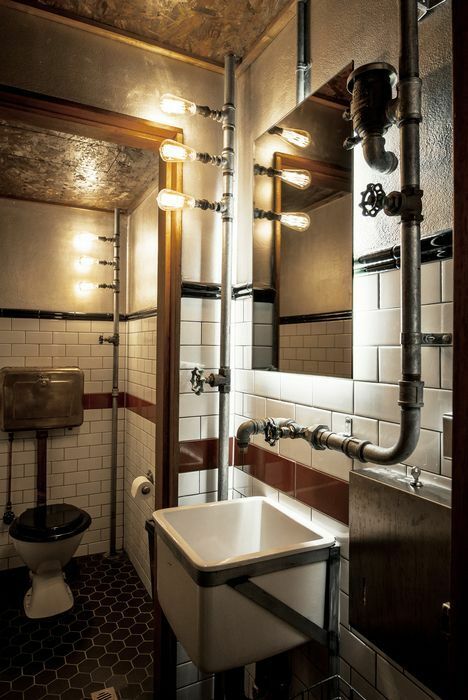 The stumblingly finished walls heighten the appearance of the steampunk bathroom charmingly. And so do the shadowy lights. Blending technology with organic elements, this industrial pedestal sink smoothly combines the history with the present through its unique artistic design. From the ancient boiler style body to the polished bowl with the open copper pipe faucet, this industrial sink embraces the definition of steampunk decor. 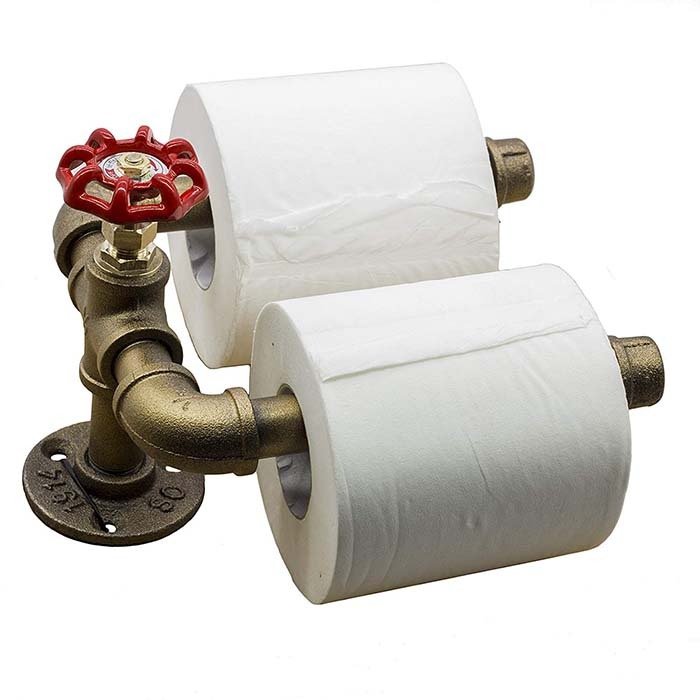 Steampunk style has always been synonymous with mechanical fixtures and plumbing elements. 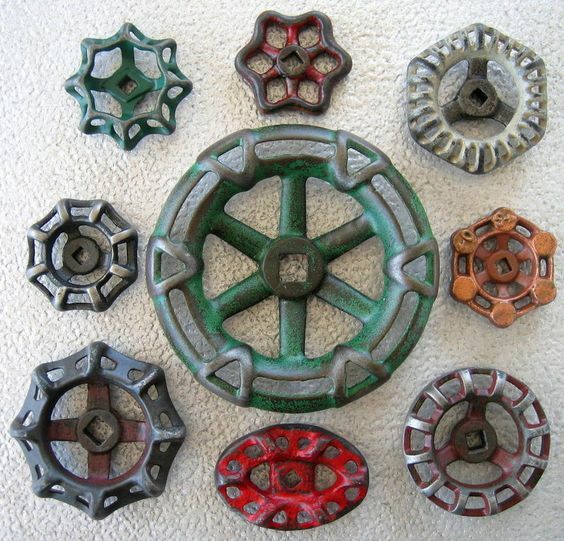 In this line of thinking, these hose knobs in various sizes and shapes usually work as steampunk valves. They ideally fit the whole concept of industrial-inspired bathroom interior design. Let me ask you – what would fit best a vintage wooden vanity? Answer: a DIY steampunk toothpaste entirely made out of copper. It’s very practical and also it’s a great accent that embellishes the industrial vibe in your bathroom area. The steampunk custom is apparently seen from the shelves made out of wood and metal pipes imitating the ones in the industrial area. The mechanical elements and plumbing features makes it look like a steaming machine. 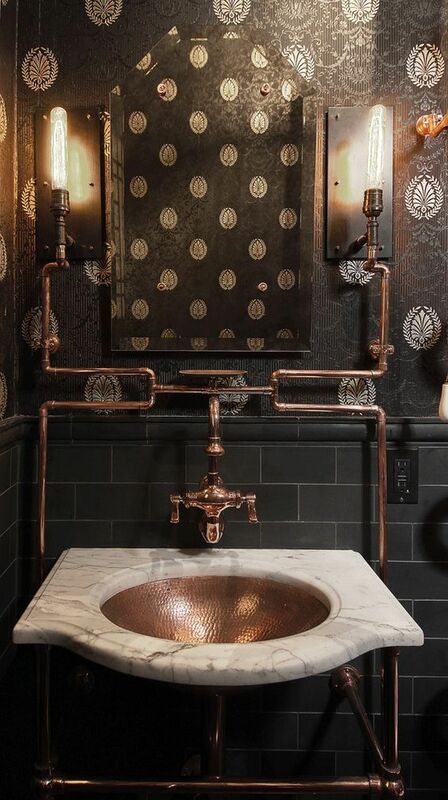 The unique copper faucet is certainly the focal point of this steampunk bathroom. 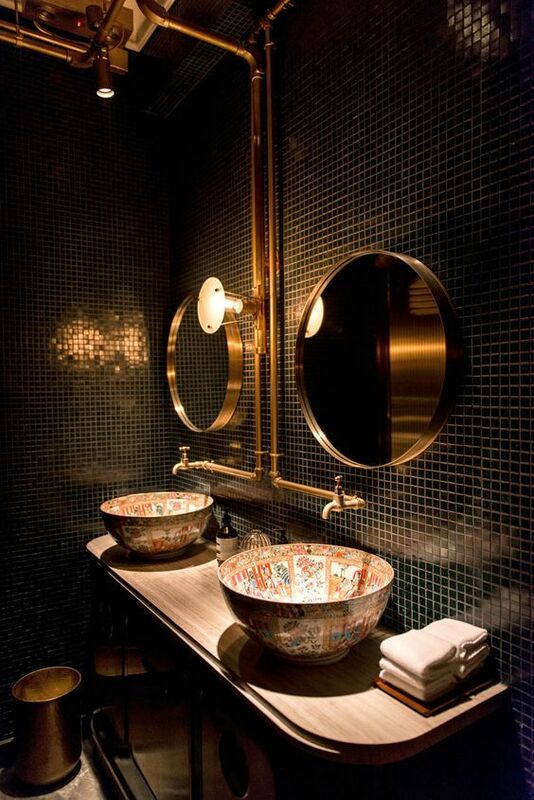 Even though some of you might think it’s too cold and masculine, we love the nice contrast between the glass sink, the painted wooden wall, and the copper material. We love saying that the little elements matter most! 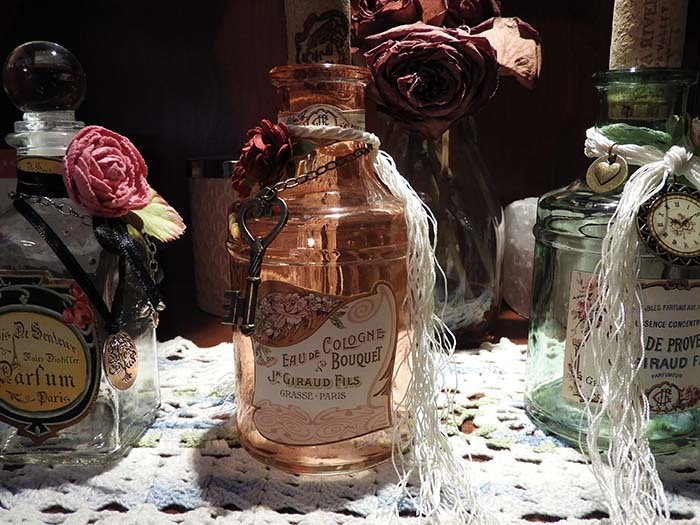 As proof, take a look at these old looking bottles with a vintage label – they look like something you’d spot on the dressing table of an 1800’s lady. Great addition to every steampunk vanity counter. This 3-piece bathroom set is entirely handcrafted and one-of-a-kind. It’s like an element of one of Terry Pratchett’s books. The complete design of this set seems to be coming straight out of the mechanical industry. It will definitely add unparalleled charm to your Victorian-styled bathroom space. The idea of owning a steampunk toilet seat seems odd for some of you, however, it’s a great way to make a strong statement. Simply use a basic wood toilet, and decorated it with metallic letters and cut off bold heads to make an original innovation meant only for a industrial bathroom. If you don’t want to add more steampunk accessories, it’s a good idea to think of painting the walls in different color than white. You would agree with us that painting a steampunk style bathroom in blue gives a nice nautical touch. It brightens up the entire space in a very delicate and complimentary way. 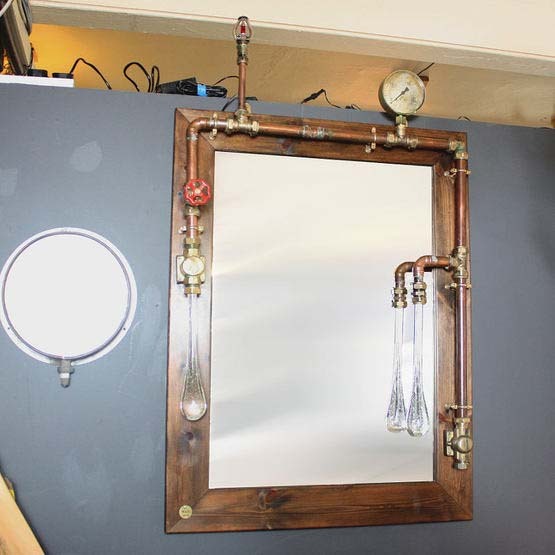 This industrially themed mirror includes a wooden frame with brass pipework with scale, sprinkler, stopcock valve, and custom made water droplet LED lights. Ideal choice for those of you who are in search of an cool industrial design. There will be specific material that will arise throughout every component that forms a stylish steampunk bathroom. As a matter of fact, the ones mentioned below are those which develop the steampunk design to your bathroom area. So take a look! Wood should always be a fundamental part of every steampunk bathroom fashion. It can be present on the bathroom floor and shelves, for instance, in order to add some marine steampunk vibe. Or you can just display some wooden bathroom accessories. If struggling to choose the color of the wood, focus on the dark mahagony, it would do a great job. If you decide on a steampunk naval floor design, take into consideration that the room air flow must be accurately designed. If not, the steam will tend to spoil the dark wood planks on your floor. In addition, you should be careful with the steampunk shower design. Even though the copper showers are simply great, they must be properly designed. Otherwise, you will find yourself wetting your floor on a daily basis. 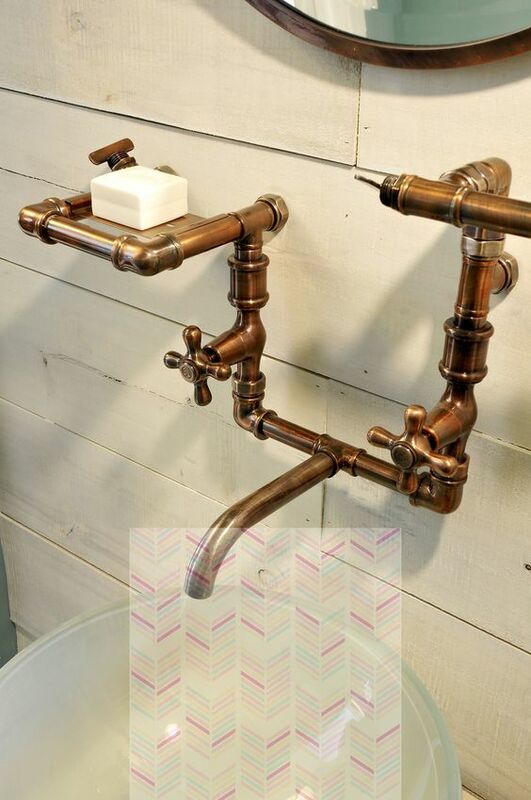 Copper is the other key material that will compose your custom made steampunk bathroom. The best part is that this material can be easily used to form every object that your bathroom needs, starting with showers, faucets, mirrors, sinks, towel racks, taps, and more. The copper details will fit ideally the wooden elements in your bathroom. The principal idea behind this technical note is that you need to place as little as copper as its required to produce a top-notch steampunk environment. 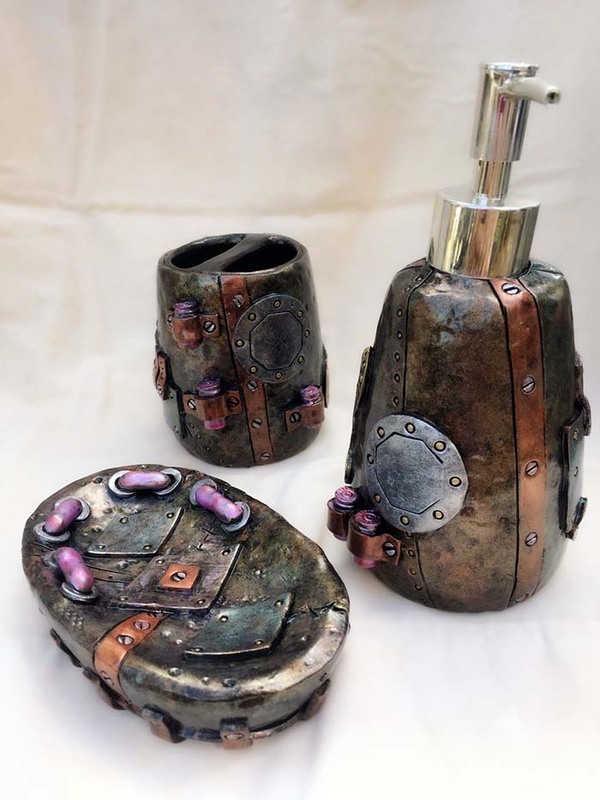 Using tin and bronze components will surely embellish the steampunk vibe to your bathroom interior. Moreover, the tin amazingly interacts with the wooden material. Together, they create a great steam-themed atmosphere. However, we believe the tin and bronze materials are best as an accessory. Tin’s layered color does not always give that Victorian looks from old centuries. So, our advice is to use it in just a few accessories. They can be some decoration or piece of wall art as well. But do not overdo. Or other, you will be endangered to clouding your steampunk bathroom design.